Guest presenter Peter Koonce, P.E., will share case studies and best practices for safely accommodating people on bikes in urban transportation environments. Peter Koonce, P.E., manages the City of Portland Bureau of Transportation’s Signals, Street Lighting, & ITS Division and is responsible for the oversight of an annual budget in excess of $13 Million. He has served as an adjunct professor at Portland State University teaching graduate level courses in transportation engineering. He is a member of the Bicycle Technical Committee of the National Committee on Uniform Traffic Control Devices and is Chair of the Transportation Research Board’s Committee on Traffic Signal Systems. Peter is active with multiple professional societies including Institute of Transportation Engineers, the National Association of City Transportation Officials, and the Association of Pedestrian and Bicycle Professionals. During this first presentation there is a brief introduction to the concepts that have been part of the emerging emphasis on improving the livability of urban centers. There are examples of policies used in Portland and how it changes the traffic engineering approach. The information includes new materials included in the National Association of City Transportation Officials (NACTO) and other design guides that enable engineers and planners to implement multimodal solutions. The issues described include performance measures, design assumptions, and other traditional practices that have lead to suburban development and suggests alternatives that are important to working with the community to implement change. The Manual of Uniform Traffic Control Devices (MUTCD) is an important document for transportation engineering design and allows a significant amount of multimodal facilities. The role of the MUTCD and the treatments therein are described as well as a highlight on the research bias included that has lead some agencies to question the usefulness of this document to implementing and increasing safe infrastructure. communities about treatments to improve cycling infrastructure. The treatments in the Guide are based on examples from around the US that have proven to increase the safety and comfort of people on bicycles. 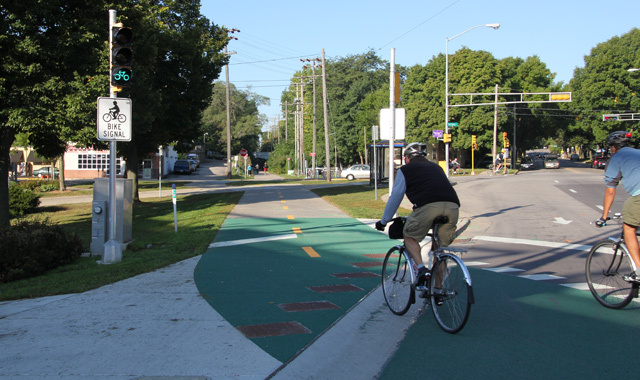 The street design principles also provide benefits to other multimodal users and tradeoffs related to the implementation of bikeway facilities are described. Traffic signals are where conflicts are managed in the transportation system. Significant opportunities to improve multimodal transportation exist if the policies are implemented in the details of signal timing. The use of treatments such as transit signal priority, both active and passive will be discussed. Several examples will be provided from downtown Portland, Oregon. There is often examples of street design improvements that are necessary right outside the door of the training facility. Where applicable, a walking field tour will be used to generate discussion related to the topics covered in the morning and to have participants brainstorm opportunities for implementation. A short presentation related to other examples observed throughout the City will be provided by the presenter. Case studies are often the most effective way to share information about how innovation occurs in transportation design. Three case studies will be presented that trace the existing problem, the background policy of the agency, the performance measures used during the analysis, and practical solution that was implemented and the outcomes. For PDH credits, we will supply registered workshop attendees with a confirmation of attendance, the agenda, and a certification of the number of contact hours for the seminar. Please refer to the Georgia Secretary of State website for more information on PDH credits. Georgia Bikes has submitted this workshop for AICP CM approval with the Georgia Planning Association. We will post the approved course ID when it is available.